It’s been one year since Little Fried Chicken and Sushi returned to regular updates after a year hiatus. Here are some of my thoughts on why I stopped and started again, and ideas for how you can move forward with new creative projects when you lose passion for your work. I’ll never forget, feeling so burned out two years ago from work and life that even drawing comics didn’t make me smile. In my mind at the time, ending Little Fried Chicken and Sushi comics was the only way to rest and heal. And why keep it going? No new readers were discovering the strip. 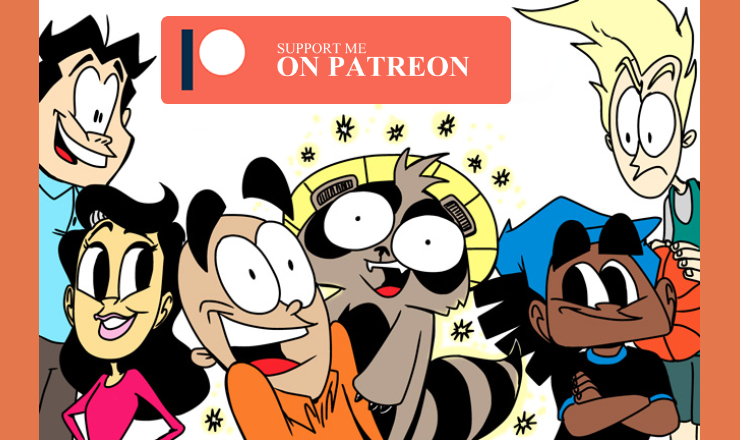 I had a decent amount of support on Patreon -even though it didn’t feel like enough to me. So, I ended Fried Chicken and Sushi completely. Finally! I would have time to rest and take things slower. Not true. I started drawing for fun in my sketchbook more, and sharing those sketches on Instagram regularly, eventually feeling the drive to grow as an illustrator. But that didn’t make me happy. Single images are fun, but I always yearn for more of a story -a sequence of events and the visual pacing only possible within panels. Even though making comic strips two to three times a week is difficult, I had to face the truth. Making comics, made me happy. I needed it in my life. So, I started brainstorming possible concepts and characters to develop a new comic. I got close with a strip idea entitled “The Honeybuns.” The strip was named after a rabbit family of four, and the humor primarily revolved around their life living in Silicon Valley. My goal was to parody the stressful and ridiculously hectic lifestyle of bay area families, but instead of humans, using busy bunnies. Here are some of the sample strips from my submission packet. What do you think? Should I have stuck with this concept? Are you happy I moved on? This is a small sample of my submission. If you would like to see more let me know in the comments. No syndicates were interested. Not even GoComics, the one that syndicates FC&S online. I received some helpful feedback but ultimately had a choice to make. Either keep working on improving “The Honeybuns,” a more mainstream strip idea or start Little Fried Chicken and Sushi up again. I knew the world and characters of Little FC&S best, so it would be easier to just start again. That way, I could get better with something familiar and have an easier time creating new strip ideas. The big question for me was -why restart a comic strip that wasn’t that popular in the first place? One answer was pretty obvious. The election of Donald Trump as president. What felt like a rise in Americans sharing their outright racist opinions in public, online, and through committing hate crimes, helped to light my motivational fire to continue drawing a positive black family in comic strip form. I noticed there were few humor strips with people of color, let alone with both African-Americans and Japanese main characters combined. Fried Chicken and Sushi could be the voice of a new comics generation. Or, at least, one voice from the minority perspective. A voice with the opportunity to speak to a broader audience about living overseas and being open to other cultures through the GoComics platform, where only a handful of comics with people of color are syndicated. The other factor is authenticity. Only I could write and draw FC&S. Gag ideas come from my experiences as a black man who lived in and visits Japan. My unique worldview in writing would set it apart combined with my individual art style. If it comes down to it, pick a project with a subject matter you know well or have a passion for and present it in a way that brings joy. Perhaps, creating new project ideas feels easier while you are writing and drawing an already established project because you’re working out your “idea muscle” every day. Taking a long break might just slow the process down and weaken your creativity. There are benefits to keeping that creative fire burning! Does this mean I have a new and better comic strip idea brewing in my head? Honestly, no, not yet. It’s fun to work on improving my gag writing and character development skills through producing Fried Chicken and Sushi comics consistently every week. I hope you’re enjoying reading them and I look forward to your feedback. Little prancing Batman ready to fight crime with a flair for the silly! Saturday, September 17th 2016, marked Batman Day, a time to commemorate the creation of the Dark Knight and appreciate the cultural impact the character has had on the whole entire world! Special events were held around the globe and celebrities, artists and big companies joined in. Batman is my favorite superhero and even though life has been pretty busy lately, I squeezed in time to draw the above sketch. Actually, I didn't draw this one until a few days after Batman Day but it was still fun. It's quite pleasurable to take serious characters and add a little silly to them. Can you imagine how odd it would look to see Batman prancing down the street at night? He'd probably scare off all the criminals. Batman's gone crazy! I used blue pencil for the sketch and then black pen I got from the dollar store in Japan. It's called a Magic Drawing Pen by Rushon, 0.5 size. Even though it was cheap, I love inking with it! Have a great day and do a little prance to commemorate good ol' Batsy!